If you were rich and powerful, from the late 1500s on into the late 1700s, you would show off your wealth by adorning your fashionable clothing with yards of handmade lace. This was true in Ipswich, Massachusetts, a town whose history is explored in our Within These Walls exhibition. Among the artifacts displayed in the section on the Choate family is a reproduction bobbin lace pillow showing lace being made. It's there to illustrate the importance of Ipswich's lace industry in the late 1700s. Replica lace pillow on display in the Within These Walls exhibition. On the pillow is bobbin lace being made with black silk thread on a parchment copy of the Ipswich lace pattern from 1789 to 1790. The lace pillow is stuffed with firmly packed straw and covered with two layers of linen fabric. The display includes hand-whittled bamboo bobbins and handmade brass straight pins. We don’t know exactly when or how lacemaking got its start in Ipswich. What we do know is that lacemaking was well enough established that, in 1768, some accounts and financial transactions were settled by exchanging valuable lace for other goods. In an Ipswich merchant’s account book—part of the collections of the Peabody Essex Museum—we find an entry for a David Pulsipher promising to pay for five yards of chintz with lace, which Pulsipher’s family was granted five weeks to make and deliver. When the U.S. Congress convened in New York in 1789, one of its early acts was to task Alexander Hamilton, Secretary of the Treasury, with taking a census of manufacturing within the 13 states. Among the data assembled was a report from Ipswich, Massachusetts, on the town’s thriving handmade lacemaking industry. The Reverend Joseph Dana was asked by George Cabot, a wealthy merchant and U.S. senator from 1791 to 1796, to collect the information in and around Ipswich. Dana surveyed the Ipswich households and found they were engaged in two kinds of manufacturing, both related to textiles. One was cordage (rope) and the other lace. On lace, Dana reported that in the town of Ipswich there were “probably not less than 600 persons who do more or less in it; some devoting the most of their time to; other, little intervals only." Dana wrote on January 24, 1791, that, “in various parts of Massᵗˢ the Females make Lace & edging for their own use & some small parcels for sale, but I believe the manufacture has nowhere become of sufficient consequence to attract notice except at Ipswich.” The report shows that, in Dana’s estimation, about 600 women and girls made 41,979 yards of lace worth £1,869.8.10. Dana supposes that there would be a deduction of about one third from the price of the lace for transportation and markups by the merchants, leaving approximately £1,270 for the Ipswich lace makers for one year’s lace work—a sizable sum for 1790. Joseph Dana’s report included 36 samples of lace from Ipswich, Massachusetts. The samples were scanned onto microfilm and are now available online on the Library of Congress’s website as part of the papers of Alexander Hamilton. Of these lace samples sent to Hamilton, 22 were made with black silk and 14 with white linen thread. The samples were never passed on to the president, but were kept with Alexander Hamilton’s correspondence. Twenty-one of the black Ipswich lace samples made between August 1789 and August 1790 are preserved with Alexander Hamilton’s papers at the Library of Congress, where they can be studied. The Ipswich laces were made on a simple round bolster (called a lace pillow) stuffed with seagrass. The fabric covers were made of homespun linen and covered with a second, replaceable layer of linen or with pieced-together scraps from old clothing. The threads for the lace were wound on four-inch-long bamboo, reed, or wooden sticks, called bobbins. 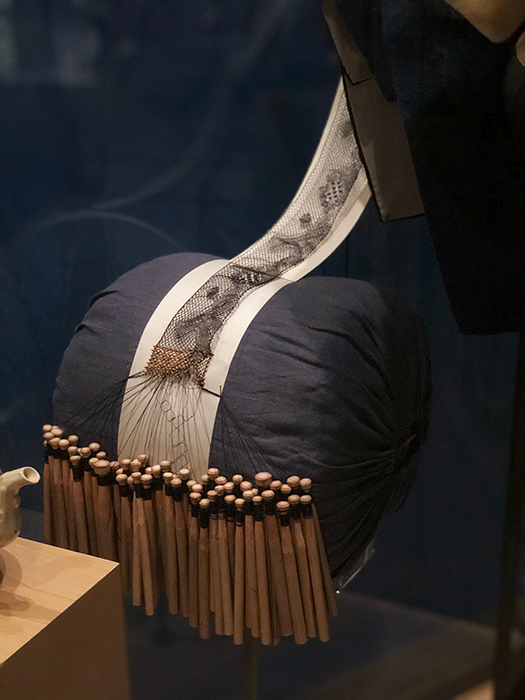 Lace makers used a parchment or linen pasteboard pattern that was long enough to encircle the 30-inch-circumference lace pillow, and straight pins, which were handmade and expensive at that point. The threads were either silk or linen. Both types of thread were probably imported from Europe, as the local silk thread production was not very successful, and the American linen thread was not as fine as the European. Lace pillow, bobbins, patterns, and lace. E386685 and E386686. Ipswich lace pillow and bobbins. E383685. A detail of lace on the pillow. E383685. 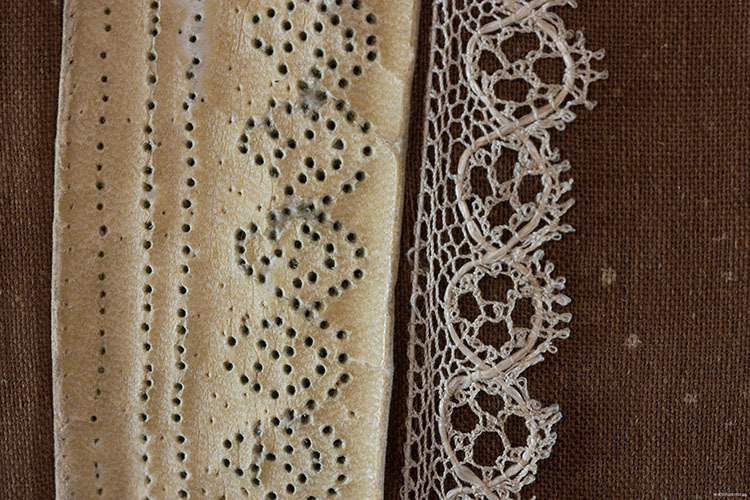 One of the lace samples preserved with Hamilton’s correspondence has a direct connection to an object here at the museum—a lace pillow. This pillow was donated to the Smithsonian Institution by the great-granddaughter of Elizabeth Lord Lakeman. Lakeman was born in Ipswich in 1767 and died in Hallowell, Maine, in 1862. She was a lace maker in the late 1700s and might have made the lace sample among Alexander Hamilton’s papers that corresponds to the lace pattern E383686, shown above, that she owned. Lakeman made lace on this pillow until her death and her last piece is still attached to the lace pillow. It is of a style commonly made in the mid-19th century. This lace pillow was on display in the Within These Walls exhibition when it opened in 2001. When it needed to be returned to rest in storage for preservation reasons, I was asked to make a replica. It became a team effort with two other volunteers. Sheryl de Jong made the lace pillow, Nick Carter whittled the bamboo bobbins, and I made the pattern and lace. We purchased handmade brass pins. The pattern E386686 was chosen for the replica lace, as it is from Ipswich in the late 1700s, and corresponds to one of the lace samples in the Library of Congress, where I could study it. Bobbin lace sample made in Ipswich in 1789–1790, possibly by Elizabeth Lord Lakeman. Black silk. Courtesy of Library of Congress. Pattern for bobbin lace made in Ipswich around 1790, corresponding to one of the lace samples among Alexander Hamilton’s correspondence in the Library of Congress, and used as a model for the replica lace in the "Within These Walls" exhibition. Linen pasteboard. E386686. Other black silk laces in the museum's collection that probably were made in Ipswich in the late 1700s include the one below. 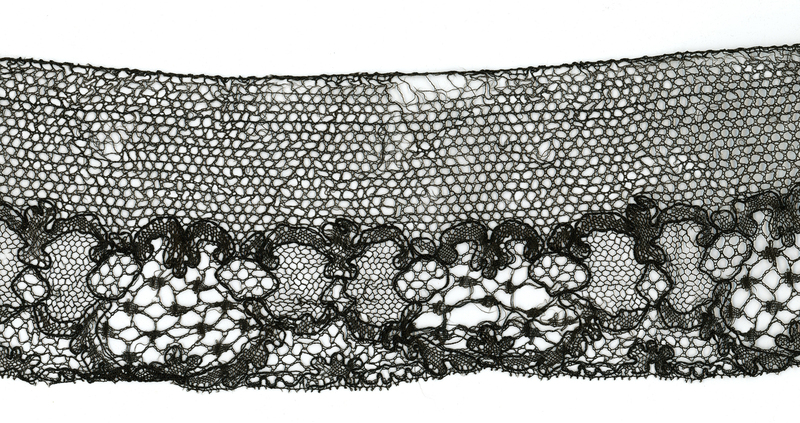 Black silk lace in the style of the Ipswich laces made in 1789–1790. Probably made in Ipswich. H39069. These borders and edgings would have been used on capes, hoods, shawls, and other articles of clothing. The handmade bobbin lace industry continued in Ipswich through the early 1800s, when demand for lace diminished due to changes in fashion and competition from the newly developed machine-made laces. The Boston and Ipswich Lace Company built a lace factory for making nets (sometimes called bobbinet—not to be confused with fishing net) in Ipswich in 1824, and the New England Lace Company did the same in 1828. Some of the local lace makers were employed to do the embroidered (or “needle-run") decoration on the fine netting, and to mend and wash the finished product. Both factories closed after a few years and the handmade lace industry in Ipswich never recovered. Lady’s embroidered net cap from the early 1800s made of the type of machine made net made in Ipswich in the 1820s. The floral pattern is made by embroidering on the plain net. The cap is bordered with a handmade bobbin lace border of the type made in Ipswich in the late 1700s. Karen H. Thompson volunteers with the textile collections in the museum's Division of Home and Community Life. She has also blogged about the delicate war laces of World War I.